The Scottish Government has recently published two ground-breaking documents – the first Strategic Transport Projects Review and the second National Planning Framework (NPF2). Their publication in the same week seems to have been no coincidence, but appears to indicate a move towards greater co-ordination of land-use and transportation planning at the national level. Whilst Ireland may have had a national plan for a few years, it is still a relatively new concept in the UK. These documents haven’t come out of the blue, but are the result of a long period of research and consultation – including, for example, research into transport and economic growth in Ayrshire that I was involved with a couple of years ago. It’s interesting to see how the results of that research have been translated into proposals, such as the West Coast Main Line freight improvements proposed in the Strategic Transport Projects Review. 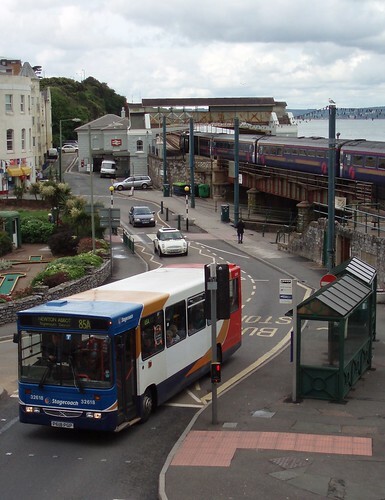 The Strategic Transport Projects Review (STPR) brings together strategic proposals for road, rail and air into one strategic policy document – a long overdue move away from the conventional government approach of planning separately for each mode of transport as if the others didn’t exist. Maintenance of the existing transport network is given strategic priority, at the top of the list. This is a refreshing change from our British cultural fixation with building new facilities whilst letting existing stuff go to rot, an attitude which is wasteful, costly and hardly the most sustainable way of doing things. The STPR specifically states that new infrastructure proposals will only be considered if similar results can’t be achieved through better management of the existing network capacity. Provided that it doesn’t become a licence for cost-cutting in the future, this is eminently sensible. Excellent though it is, could the STPR have gone further? How about some consideration of what our transport needs and options might be towards the end of the 20 year lifetime of this document? Personally, I believe that as we get towards 2030 we’re going to see key sections of our strategic transport infrastructure becoming completely choked – even with full implementation of the STPR and a greater move towards sustainable land-use and transport policies over the next few years. 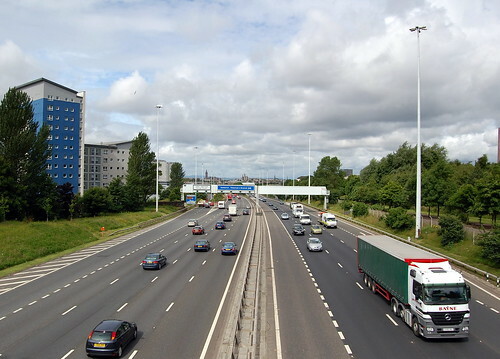 The M8 through Glasgow is one example. 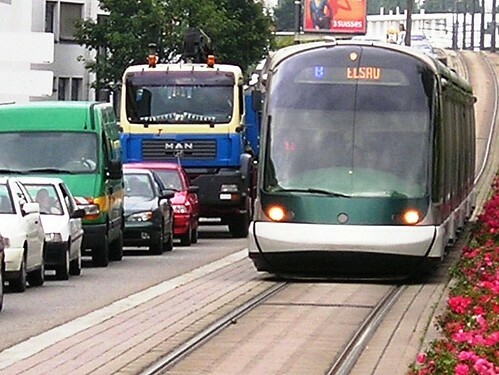 It provides a spacious transport artery directly through the city, passing very close to the city centre. At the moment, this artery is completely devoted to road use. It’s already clogged with traffic at peak hours: it doesn’t take much imagination to see that within 10 years it’s going to be choked throughout the day. But is stationary traffic the most efficient use of a continuous, uninterrupted corridor through the heart of Scotland’s biggest city? Should we not be considering ways that artery could be shared with other more efficient modes of transport, which move more people more quickly and more cleanly, to better contribute towards economic growth and air quality? Re-allocating some of the M8’s current road space to another mode of transport which can carry greater numbers of passengers more efficiently, such as light rail, should at least be considered as a possibility. Appropriately located stations – integrated with local bus, rail and subway routes and the new strategic park-and-ride facilities proposed in the STPR – could connect the city centre and other intra-urban destinations with residential neighbourhoods and destinations further afield. What’s more, we should be considering this kind of idea now. This is for the simple reason that we need to ensure that future land-use and transport planning decisions do not prevent its implementation over the next few years. The country is littered with disused rail routes which have been rendered difficult or impossible to re-open by land sale and development since Beeching’s closures in the 1960s. To be fair, the STPI does not exclude this kind of longer term thinking: for example, it states that the proposed West of Scotland Strategic Rail Enhancements could include developing a light rapid transit network across Glasgow, which could of course include adapting the M8 corridor. But it is a missed opportunity not to begin considering these issues publicly now, if only as options. If nothing else, it would demonstrate a greater willingness by civil servants and politicians to engage with the public on big, long-term that are conventionally decided behind closed doors – so helping to rebuild public involvement in democracy. Within days of the STPR’s publication, Scotland’s second National Planning Framework – NPF2 – was laid before the Scottish Parliament. NPF2 gives spatial perspective to Government investment, something that has long been missing at the UK level. Scotland is leading the way by translating national objectives into an overt spatial strategy, and bringing together all of the government’s environmental policy areas – planning, regeneration, transport, energy, environment, waste, water and so on – into that spatial vision. The new version of the NPF has gone beyond the largely descriptive nature of the original NPF1, prepared in 2004, to include more direction about the spatial requirements of policy requirements over the next 25 years. It goes beyond simply describing the country’s existing geography to propose strategic infrastructure investments required to support Scotland’s economic growth. What is particularly welcome is the increased co-ordination between land use and transportation planning that NPF2 and the STPR bring. Taken together, the two documents combine to integrate strategic investment and policy on infrastructure and the environment. The trick now is for the Government to encourage its partners in local authorities, other public agencies and the private sector to translate these wise words into action.